A soldier uses a periscope rifle in a trench while his mate observes for him through a periscope, Gallipoli Peninsula 1915. 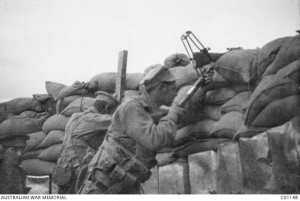 Soldiers at Anzac Cove begin to manufacture periscope rifles. A homemade invention of mirrors, boxwood and wire, the periscope rifle allowed the user to sight and fire a rifle over the parapet without exposing himself to enemy fire. Turkish troops shell four destroyers offloading Allied troops at Anzac Cove. Four soldiers and a seaman are killed; 41 others are wounded, seven of whom later die from their wounds. The decision is made to conduct all subsequent landings under the cover of night. The Australian Mesopotamian Half Flight arrives in Basra. Australia was the only British dominion to set up a flying corps for service during WWI. This entry was posted on May 26th, 2015.